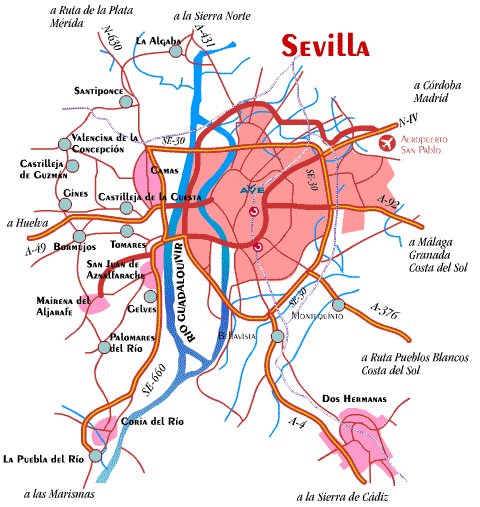 Seville is located southwest of the Iberian Peninsula, in the center of the Autonomous Community of Andalusia. Sevilla, capital of Andalusia, Spain's fourth largest city in the number of inhabitants. It has 704,414 people in the municipality. The total population in the capital and 105 villages in the province is 1,835,077 inhabitants in an area of 14,042 square kilometers. Seville can be considered, without doubt, the artistic, cultural, financial, economic and social development of southern Spain. At only 6 meters above sea level, in full Vega and orchards of the Guadalquivir River, and along it, forms an urban agglomeration that extends into the Aljarafe, marshes, Doñana National Park, the Sierra Norte and Sierra Sur. Source Town Hall of Seville. Special thanks Belén, Lorena, Manu, Luis, Jesús, Chory, Javi, Ray, Manuel, Juan Luis and many other people that with their selfless help and unconditional support, have made possible this site. Thanks to José Luis at Meteo Aerolugo for the Spanish translation control files.